I need Jesus today. I mean, I need him every day, but I *know* and am aware that I need Him today. I love it that He meets me where I am. This was my Facebook status yesterday morning. And, there's a story behind it that I want to share with you. When I wrote it, I was in the midst of one of *those* mornings. My children - up since the wee morning hours - were energy personified. And, thanks to a nasty wind storm that came through our area during the night, I was exhausted from a lack of sleep. And, our house was a mess. Because I struggle with, among other things, chronic household laziness and not only did I not feel like cleaning up a single thing the night before, I didn't clean up a single thing the night before. And, while this is a struggle with which I wrestle daily with seemingly little progress, it also carries with it the burden of guilt. It just does. Hyperactive children + exhausted, weary Momma + messy house = a recipe for needin' some Jesus. It would have made sense to reach out to Him, right? But, I decided to clean up instead. Because if I was going to mother hyperactive children in my exhausted, guilt-laden state, I was going to do it without Lego imprints on the bottoms of my feet. 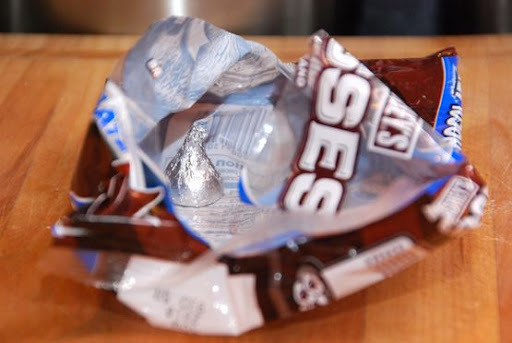 I walked into our dining room and realized that my (already prone to hyperactivity) children had gotten into and devoured my bag of Hershey's Kisses. The bag was crumpled on the table, ripped down the center, and empty. With little foil bits strewn about it. It was my fault. I, in my laziness, didn't clean up the night before, remember? So, I hastily grabbed the empty, ripped open bag and tucked it under my arm, swept up the little foil bits strung about with the palms of my hands, and huffed and puffed my way to the kitchen trash can. And, that's where Jesus met me. Standing over my kitchen trash can. I slowly untucked my empty little bag of daily, sanity-giving joy from under my arm, and peered down into the bag and saw what I had felt pressing against my side while I hostilely walked to the kitchen. It might as well have spoken audibly because I heard Jesus speaking to me through that tiny little piece of chocolate. I am here. I will meet you where you are. He is so able when we are so weak! The tears are running and my heart so gets where you were. I still have those moments even though my house is empty. His strength is perfect when our strength is gone. We need HIM every hour, our gracious Lord. No tender voice like his can peace afford. We need him, oh we need. Every hour we need him. Come bless us now our Savior, we need You every hour! That brought tears to my eyes Sarah. We have all been there as moms. :) Those are the simple moments of God. Thanks for sharing. Sarah, Sarah... I'm very touched. This is such a great post. I was really tired last night so sent the wee one to the nursery to get some sleep. Yet God woke me up at 6 am this morning telling me to spend time with him. I fought it thinking "are you crazy, I need sleep!!" But I kept hearing his voice. Finally my HOSPITAL phone rang and some guy who spoke no English rambled on until he finally understood he had the wrong number. I laughed at the things he does to get our attention :) I would have preferred the kiss!! Glad he met you too. You really do have a beautiful gift with words Sarah. I love how you can turn a post about appetizers into something that not only makes we wanna get cooking but has me nodding my head and giggling. Then you have posts like this... that truly get to the heart of the matter. And you can point us to Christ with a hershey kiss! Not to mention the fact that I love knowing I am not the only mom who leaves the dishes in the sink only to hate myself the next morning for doing so. Sarah - this is beautiful. And it makes me wonder how many times he's tried to get my attention and I've just gone on and done the dishes without noticing the "kiss" in the bag. Your last two lines really are so, so true. I needed to read them-thank you! I've been seeing lots of signs of Jesus lately too....meeting me right in the midst of the muck where I need Him. So far, He hasn't spoken to me through chocolate though. ;o) Thanks for sharing your heart. I love it. Your post is so true. He knows us and he knows if a "kiss" is what will help or if it's something else. HE KNOWS! We only have notice. I love reading this one over and over and over since you wrote it. I'm not eloquent at all, so will a *WOW* do? Thank you, Sarah!